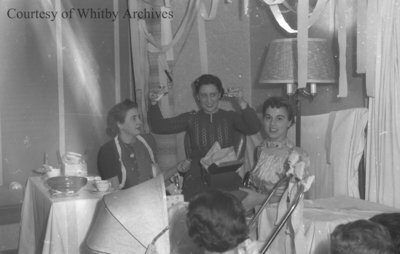 A black and white negative of three women at a baby shower. In this view the woman on the left is sitting on the floor and watching the woman on the chair hold up a gift. The woman on the right is facing the photographer. The negative envelope refers to two of the women as Hazel Wagner and Iris Beauty. Baby Shower, c.1938, Marjorie Ruddy. Whitby Archives A2013_040_729C.